Why Do My Ducts Need Sealed? They may not need it, but for home's that do have leaking duct systems, it is very important. Frequently, this can be determined by a visual inspection, but other times a duct blaster can determine how much your home leaks . There are several reasons why it is important that your duct system be well insulated and leakage be minimized--health, the life of your heat and air unit, reduction of energy waste, and to save money. Frequently, when the air conditioner and furnace are replaced, the duct work is not changed or sealed. Even if the equipment is not replaced, the duct work can leak 25 to 45%. If the leaks are in unconditioned spaces such as the attic or crawl space, then several things can happen. Dust, insulation, mold, pollen, insulation particles and bacteria and virus from animal droppings from the attic or crawl space are introduced into your home. With the central air or air handler running, these items are dispersed into every room in the house. High efficiency units cannot overcome the deficit of loss in the duct system. If you have a 3 ton unit and the ducts are leaking 30% the result is you are only receiving two tons of conditioned air to the living space of the house. When you have leaky returns in the attic, during the summer you have extremely high heat that is being drawn into the return. The system is designed to only need to cool the air about two degrees, but with higher temperatures entering the return, the system must now run longer to cool the air driving up costs and wear and tear on the unit. The same is true during the winter but with cold air. Obviously, the tightness of the duct system has a significant impact on the indoor air quality of your home. 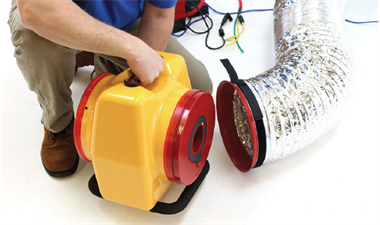 If attic air with its dirt and contaminates are drawn into the system, it is ultimately delivered to every room in your home. As we view the “house-as-a-system approach,” we can easily see that sealing the duct work allows more of the air you paid to condition to circulate within the closed system as intended and reach the proper areas of the home. It is very common to find duct systems that have gaps such as this picture. This results in your unit hopelessly trying to cool or heat the air that is escaping into the attic or crawl space. This doesn't even take into account the contaminates that can be pulled into your system from these areas. Do your ducts need to be sealed? We can help! What is a Duct Blaster Anyway? A duct blaster is a piece of equipment that is used to diagnose how much air leakage is caused by your duct system. This is a valuable tool in quantifying not only if leakage exists, but combined with a blower door can determine if that leakage is into the home or outside such as attics, garages, or crawl spaces. Duct blasters can take the guess work out. 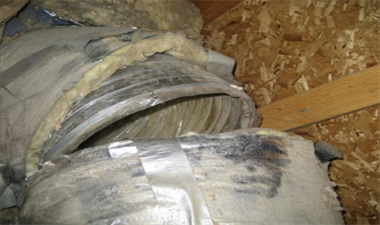 It is not uncommon to find duct systems leaking 20-40% or even higher.